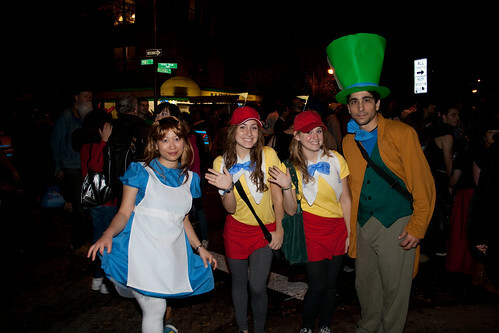 I’d been reading online about how awesome the Greenwich Village Halloween Parade was. In 2008 Dina and Brian went and confirmed that it was pretty awesome so Danielle and I decided to go because it was falling on a Saturday in 2009. Eventually we decided we’d go ahead and get dressed up as well. We thought about it for a while and realized that 2009 would be the last year for a while in which it would be original to be a character from Alice in Wonderland since the Tim Burton film was coming out in 2010. So we had Danielle’s mom make us costumes. We were talking around looking at all the great costumes. At first I was wondering what these women were since they had little flags on their hats. Then I stared at the costumes for a sec. Were they from Pokemon? No… they’re female versions of Tweedle Dee and Tweedle Dum! I summoned up my courage and asked them if they would take a photo with us. They said yes and so we took this photo. Another triumph for me for getting over my nervousness at approaching people to photograph. It started slowly gaining views. The first time I really realized this was four months ago when it had 1170 views. Most of the views were coming from Google and Google Image Search, so I assumed people were looking up costume ideas. I figured the views would taper off after Halloween. But it six days later it had another ~900 views. And, at the time I’m writing this, early March, it has 3037 views.